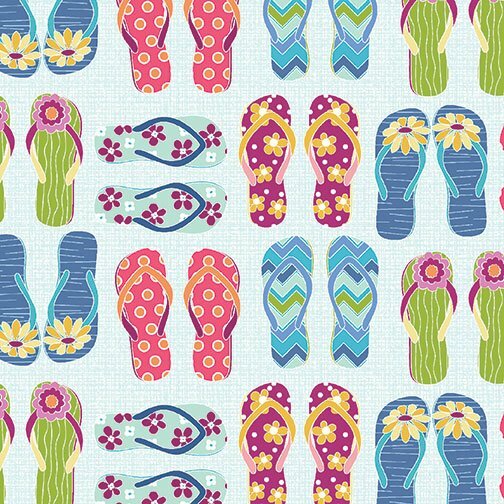 It’s summer, and the tropical flowers are blooming, the beach chairs are out, and the flip-flops are sitting on the sand. We’re ready for summer fun, and Cherry Guidry’s “Front Porch” collection has everything we need to make it happen! First, the “Front Porch” panel is full of possibilities. Complete with a lemonade stand, pinwheels and fruit, use the panel “as is,” or cut it apart for individual blocks. Next, add the cool sunglasses, fruit and little bee prints, and top them all off with colorful mini prints in summery colors of yellow, pink, orange and teal. It’s a collection that will make you smile. Think: beach bags, totes, summer shorts and dresses… so many choices!